No need for caps or a capper with these Flip cap bottles. Re-usable gasket cap assembly snaps firmly into position by means of a wire cam. Great for not only beer but also home made syrups and sauces. 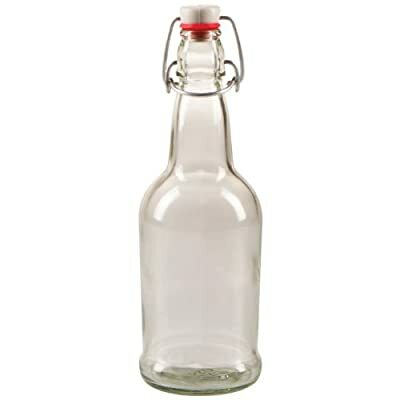 Bottles are 2 3/4" diameter x 10" tall with a capacity of 500ml. These bottles are sold by the 12 Pack. CASE OF 12 CLEAR - 16 oz. EZ Cap Beer Bottles - caps included but not assembled. Ez Cap Clear 16 Oz Bottles Are Sturdy And Ready To Be Used Over And Over For Years To Come. Ez Cap Clear 16 Oz Bottles Come 12 Per Case plus 12 caps per case!